I’ve written a bunch about how we are building this cabin, but not much lately on why we are building this thing. Since we are at a point between the first and second floors, and I’m back to peeling logs (more on that later), now seemed like a good time to review. Not only do people use widely varying methods of building a log cabin, but they have widely varying reasons for building a log cabin. Talking to other LHBA members and other builders on facebook, I’ve discovered that not everyone is going to live there full time. The reasons for building also vary. You could slice the reasons and the types of people who build into a crazy number of categories, but I’ll try to keep it simple. I did an informal poll on one of the cabin groups I’m on to see why people build log cabins. Had it not been for these [the log cabins built by the CCC in the 1930’s] the log cabin might have disappeared, but because people saw the log structures and liked what they saw, many began to build modern log cabins and log houses. These homes seemed to represent all that a family could want: a sturdy shelter from the elements and a simple, self-sufficient lifestyle. The log cabin remains a popular building style. Popular, but yet rare. 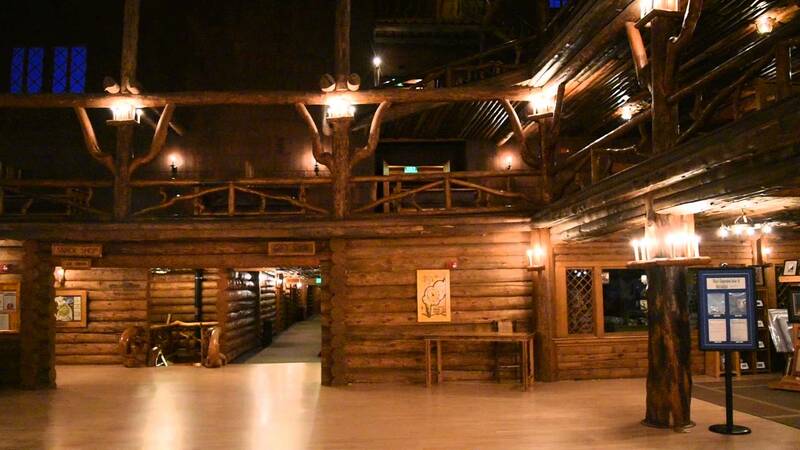 There are no statistics on how many log cabins are out there, but they remain a very popular (at least in the imagination) and an iconic building style. I think the answer to “why are they so alluring” is simply because they call us back to simpler times when quality mattered. For most folks, the cost of building one is the limiting factor. Whereas a normal frame home costs about $120 per square foot, a log home can cost $150-$175 per square foot. But that’s really not that much difference for a dream. Hard to get a loan? Maybe a little. Cabins are considered unconventional building styles by many lenders- meaning they are hard to find “comparables” (other property in the area used to determine if the asking price is valid). Maybe permits and city inspections are more complicated? Yeah. But not by much, depending on where you live. Of course, this doesn’t cover our build. Our “per square foot” cost is much, much cheaper- about $20 per square foot. In our case, a log cabin was cheaper than a framed or a brick home. One reason is that the building materials can be cheaper than 2×4’s. As in free. Or, the cabin can be extremely expensive if you hire out the actual construction and contracting. But I guess you could also argue it’s only cheap because I’m pouring 30 years worth of work into building it in about 2 years. Maybe 3…. It’s always seemed strange to me that everyone loves the idea of a cabin in the woods, but not many people have them, even though price, hassle, etc. isn’t much different from a regular home, not to mention how much more environmentally friendly they can be than other styles of homes. I just haven’t been able to square why there aren’t more of them. According to my poll, people have different uses for their cabin. Some live in them full time, others use them as a get away. Why have one? The first cabin I had was definitely a get away- we drew a circle on a map with our full-time residence as the center. The edge of the circle was how far we were wiling to drive to “get away”: which was a two hour drive. Then, every weekend, we would take a different route until we were 2 hours away from home, looking for property or a cabin for sale along the way. The one we bought was built by an old farrier in his 70’s- as a get away on 20 acres. No power, no running water, too far away from cell coverage, and an outhouse. It was a simple one room cabin with a loft. And it was awesome- I could sit out on the porch some days and actually hear the nothing. At night, we were at least 60 miles from the nearest city, so the stars were extremely bright. But at 6,000 ft+ elevation, it wasn’t a place you could stay in the winter, as the county would close the road when the snow got too deep. We had a few family parties there, but eventually found that keeping up with two houses was some work. After the divorce, I had to sell it. That was painful, and I realized that I really liked cabin living better than city living. I wanted to get another one, and this time, live in it full-time. 20 acres, a cabin, and a 1973 Ford HighBoy- what’s not to like? This is where I’m headed. But when I remarried and moved to the South, it didn’t look like it was going to happen. My wife wasn’t that interested at first. A brick home was what she wanted. I was ok with that, I thought, so when I finally got through school and started making a little more money, we started looking at homes. We needed a big one- 6 kids between the two of us, and we both have lots of hobbies- sewing, knitting, art, music, woodworking- we needed plenty of space. Of course, I wanted as much property as we could afford. Which meant very few homes made it on the list, and the ones that did were usually in need of major renovations, and many of them had plenty of smells to go along with them. 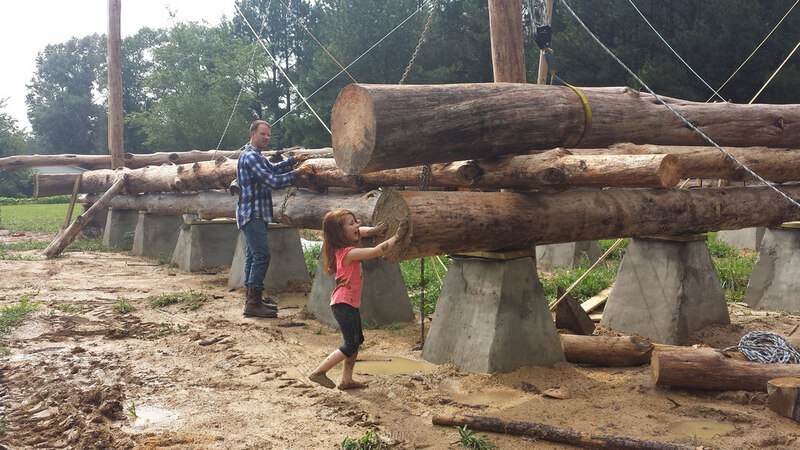 You can read more about the beginning of our log home journey here. Now they do have cabins here in the South- but not like the ones out West. Here we have dove tailed square oak beam cabins. Out West, it’s more solid log coped cabins. They are ALL pretty in my book. The eventual plan is to have a small hobby farm, and of course I want my garage for woodworking and building rustic furniture. The idea is to become more self-sufficient. We are building this cabin without a loan, paying as we go. There’s no mortgage on the house- when we’re done, we’ll own it. We’ll try gardening, and raising chickens and bees. Maybe some of that will provide some income. When you’re peeling logs, it’s easier and more fun to think about this kind of stuff than how sore and tired you are from all the work. Which brings me back to peeling logs, which I did almost all of last week. See, when we started stacking, we decided that we were going to stack logs in this manner: the biggest logs would go on the bottom, and decrease in size as we worked our way to the top. That way, even though our logs have more taper than anyone else’s home on LHBA, at least we would have control over the size of the logs. We also decided to stack so that the butts of the logs faced the front of the home- this gives the home a “massive” feel to it, and also provides extra support for the roof – which hangs about 6 feet out from the corners. There were still some trees on our property that needed to come down, and as we got higher with the stacking, I noticed that few were too close for comfort to the house (in case of a tornado). So I cut a few down. Julie measured them, and what do you know- they were the same size (about 5 feet around) as the ones we were using on layer #6- which meant we needed to use them now, or risk stacking big logs on top of little logs. I cut down about 8 more of that size. sweet gum tree. 55 feet long. Log arch to lift it onto the trailer (on right, almost out of frame). I also cut down a sweet gum tree that is about 55 feet long, has a 29″ diameter base, and a 15″ tip, and is almost perfectly straight with no large branches. 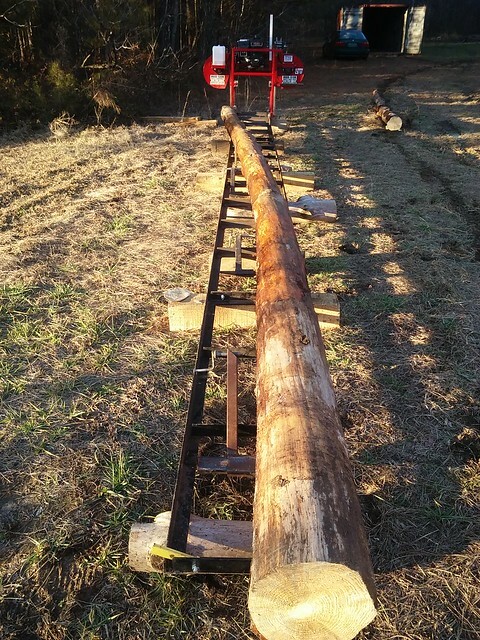 In other words, the perfect size for a ridge pole – the longest, straightest, biggest, “most righteous” log. But I’ve heard from folks that they twist as they dry. I can’t even budge it with my tractor. 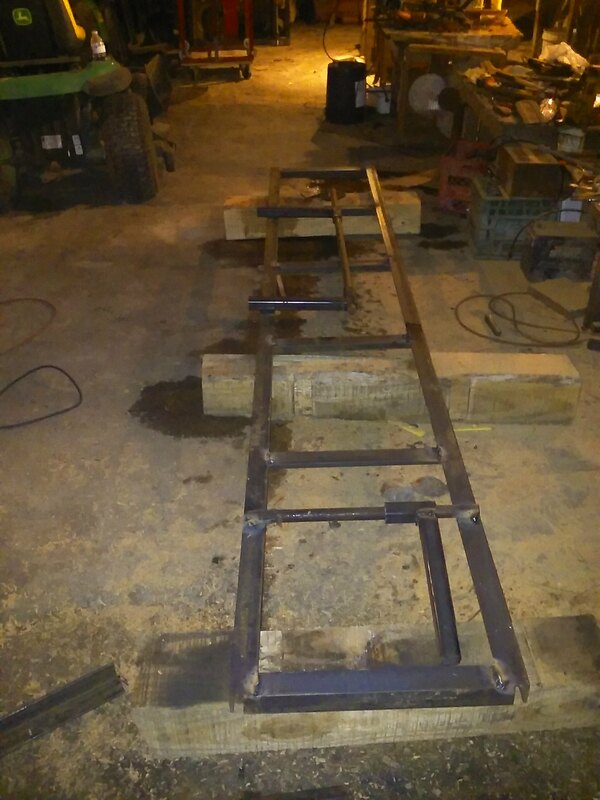 If I don’t use it for a ridge pole, it would make an awesome dining table, along with some end tables, and maybe a door. The other choice for my ridge pole is a giant oak further back in the forest- it’s about 26″ at the base, with minimal taper. I don’t know the tip diameter, but it is even longer- almost 65 feet by my estimation. 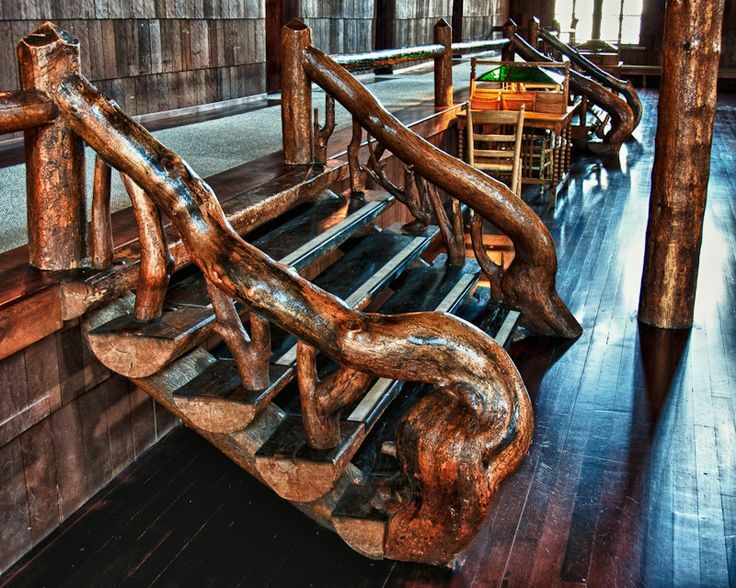 And according to woodweb (they have a weight calculator), it probably weighs about 7,000 lbs. I’ll need help moving it. Did I mention it’s an oak tree? How awesome would that be for a ridgepole? That’s it for now, back to work. Leave a comment if it suits you. For the un-initiated, RPSL’s are Ridge Pole Support Logs. They are the vertical logs that hold up the ridge pole; while the ridge pole is the log that holds up the roof- it’s the highest log in the whole house, and according to Skip (founder of LHBA), it should be the longest, straightest, most righteous log you have. This is Paul Kahle’s log home- one of our members- built just like we are doing with lifting poles. 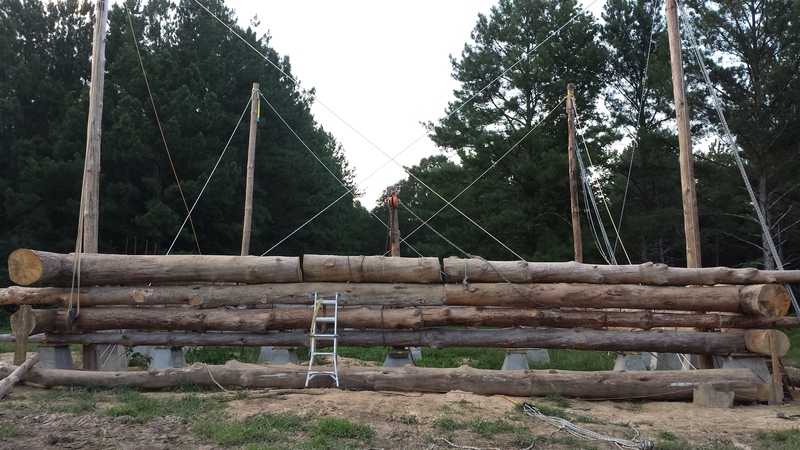 The ridge pole is the log he is sitting on, while the RPSL’s are holding it up. 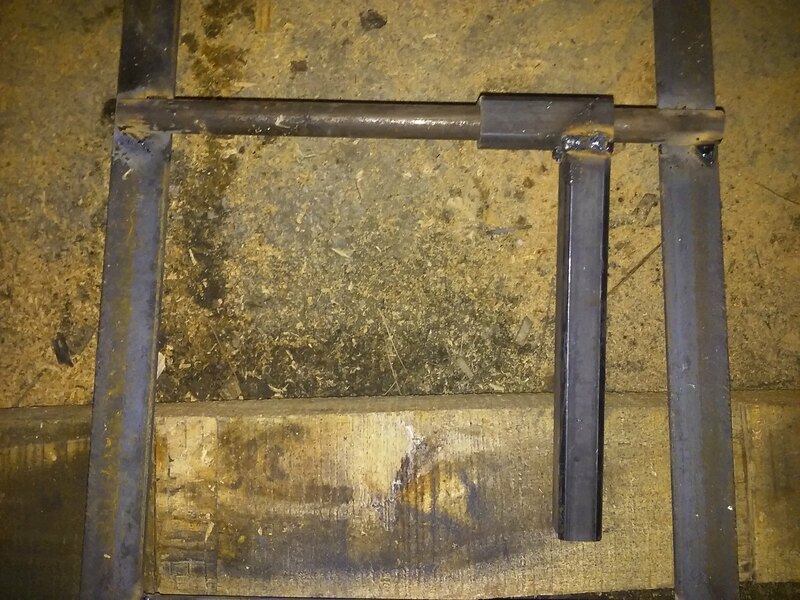 A GSL is the Girder Support Log- it holds up the Girder Log that holds up the joists for the second floor. The GSL goes through the middle of your house, perpendicular to the ridge pole. You can see one of the RPSL logs bolted to the wall, a center RPSL, and the GSL bolted to it. The GSL is the one holding up the girder in this photo. This is the home of Tracy Nichols, also one of our members. 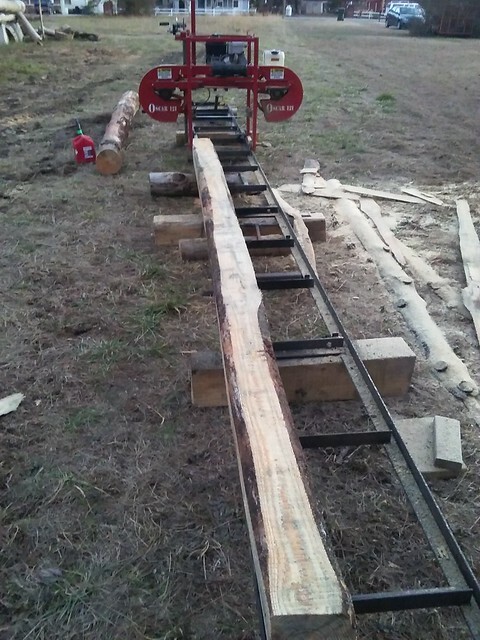 You can install the RPSL’s as soon as you have enough wall logs to support them- most LHBA members install them when they have six courses of logs installed- but that is if you are using a telehandler. The book recommends installing them when you have your walls up. Julie and I have discussed when to put them up with a lot of positives and negatives. If we put them up now, we could use them as temporary lifting poles for crooked logs we need to cut in half. I’m actually at the point where temporary lifting poles aren’t tall enough to be of any use. And if I get taller temporary lifting poles, well, they are just too heavy to get in position. The girder log could go in now or later. If we do it now, we can use crooked wall logs that we cut and leave a space for the girder log. 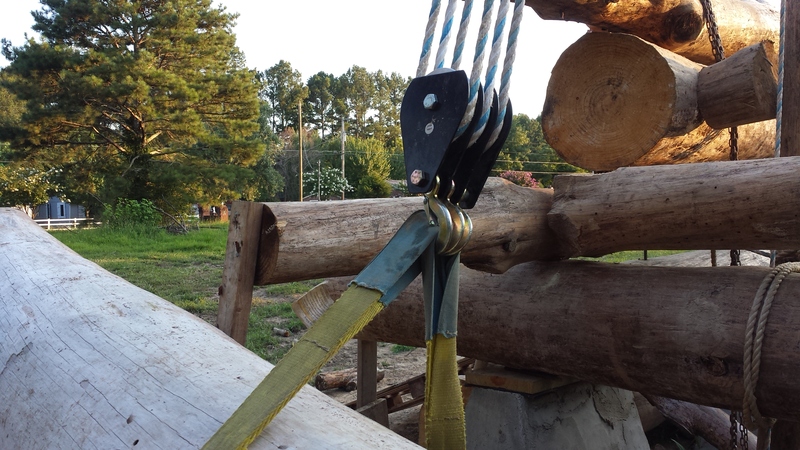 If we do it later, we can use the wall logs to attach our block and tackle, and lift the girder log wherever we want. Along with the girder log would be the GSL support log- the vertical log that supports the GSL. For now, we’ve decided to keep going with the wall logs. We are on course seven now, and it is only for logs that will not be cut in the middle somewhere- there are no doors or windows at this point in the build like there were up until now. Julie has been managing which logs go where- she measures the circumference of the existing logs, and finds the next biggest log for the next layer. We started with logs that were nearly six feet around, but now we are down to logs that are just over five feet around. We have a few on our property that needed to be cut down anyway because the eventual plan is to have a large garden and we need the sunlight. There were also few that are too close to the house. So I cut them down, only to find out that they are over five feet around- meaning, if we were going to use them, it had to be now. Otherwise, we would mess up the plan for the house of building starting with the biggest logs and going to the smallest. I’ve cut down eight trees in the past week- which also included cleaning up the branches, and getting the logs racked. 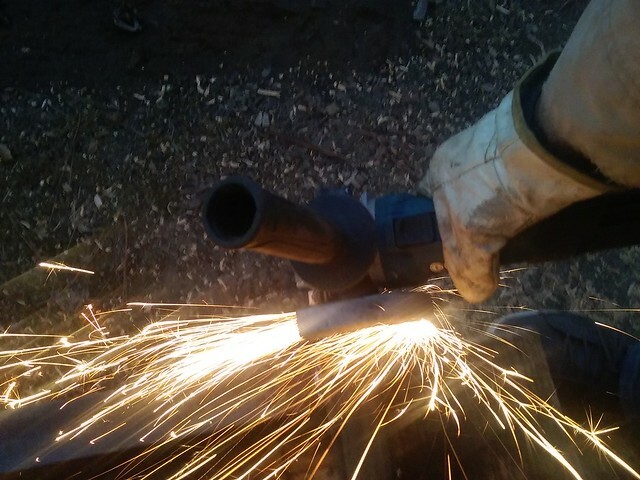 It takes almost a day to clean up all the branches-I have to wrap a chain around the limbs after I cut them off and then drag them with the tractor- it’s a lot of pulling with the tractor, and pushing the limbs into a burn pile. Very messy. Also, they need to be peeled, which is a lot of work. All of which brings up an incident this week that stopped everything: we broke a log. Julie picked out a log from rack #1. I went and hooked up to it and started pulling it out of the pile when it broke- I broke off about ten feet of it. It just snapped. I was shocked- this has never happened before. It’s a log that I think is at least six months old that hadn’t been borated. I’ve been thinking for a while that it is time to borate my logs again, and this was the perfect time to do it. I brewed up a new batch- three batches, actually. I have 7 gallons of the stuff, which is enough to treat 42 logs. I probably need more, but this is a good start. 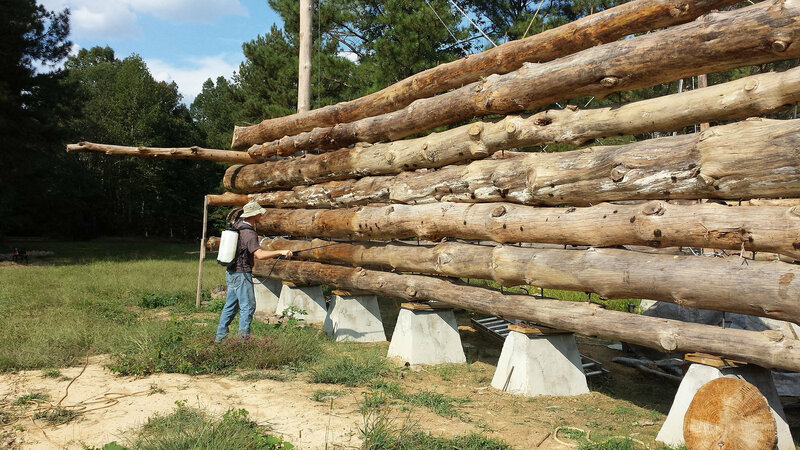 I sprayed every log on the house first, and next week I’ll move on to the racked logs. Need to finish peeling the new ones before I treat them. My new truck is a 1979 Ford F150 4×4 with a manual transmission and a 351M motor. I love how it feels. My wife isn’t so sure. I wanted something more “EMP proof”, and this is what feels right. I knew the clutch needed replacement when I bought it- it slipped when in gear and under a load. It either had to be the clutch disk was worn out, or it was fouled with oil from a leaky rear main seal. Either way, I had to open it up to find out. 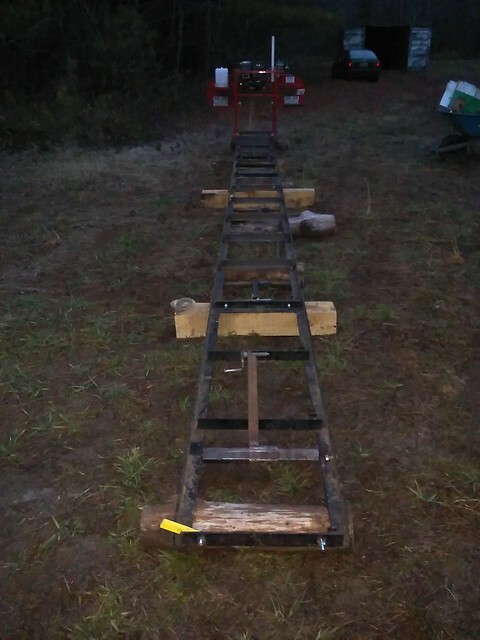 I put it up on ramps (probably didn’t need to since it is already a “high-boy”) on a Saturday and started disconnecting things. The next Monday, a city inspector showed up and told Julie “you can’t work on a vehicle in your driveway.” REALLY? They actually made a law about that. While I understand trying to keep the neighborhood looking nice, city folks have some really dumb ways of controlling everyone. Somebody called us in. We have a sneaking suspicion who it was- we asked our neighbor about it and he said he suspects the same person got him, too- he got called in last year for leaving his trash can out on the curb for more than two days. Someone with nothing better to do with their time. It’s a little ridiculous. Can’t wait to get out of the city. Anyway, had some real issues with the truck- couldn’t get the transmission to go back in. After a week of trying different things, I finally called my buddy over- he came on a Saturday. “….And I’ll be sitting here for a week trying to figure out why it won’t go in,” I finished. I turned the drive shaft, and the whole thing jumped forward into place within 30 seconds. I spent the rest of the day installing u-joints, brackets, shafts, the seat, and all the covers and electrical, got it down off the ramps, and started her up- perfect!